For more information, please visit www.theluxurycollection.com/parklane. This property is part of Marriott International’s highly prestigious The Luxury Collection, the world’s premier portfolio of luxury hotels and it is owned and operated by Parklane Hotels Limited. 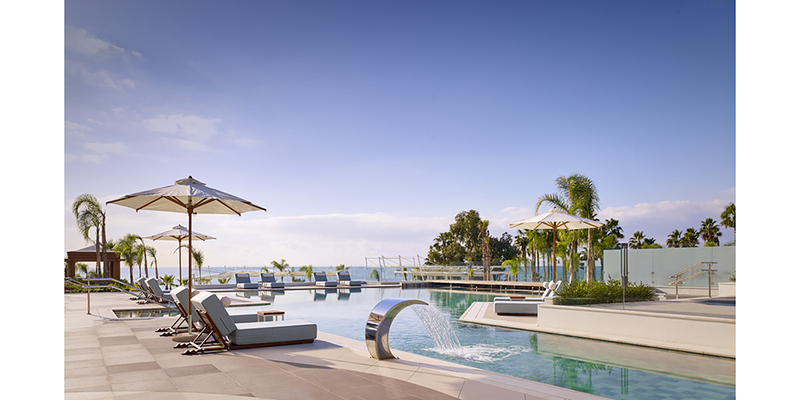 Situated in 25 acres of landscaped gardens on 300m of sandy beachfront in the vibrant city of Limassol, Parklane offers 274 sumptuous rooms and suites that have been designed by Harrods Interiors with spectacular views of the Mediterranean or mountains. The resort offers a wide variety of exciting and unique facilities including a choice of three outdoor swimming pools, seven food & beverage outlets, an extensive kids club, a luxury spa, tennis courts, a football academy, water-sports, diving school and state-of-the-art conference facilities. For further information, please visit www.parklanecyprus.com, or follow Twitter, Instagram and Facebook. The Luxury Collection®, part of Marriott International, Inc., is comprised of world-renowned hotels and resorts offering unique, authentic experiences that evoke lasting, treasured memories. For the global explorer, The Luxury Collection offers a gateway to the world’s most exciting and desirable destinations. Each hotel and resort is a unique and cherished expression of its location; a portal to the destination’s indigenous charms and treasures. Originated in 1906 under the CIGA® brand as a collection of Europe’s most celebrated and iconic properties, today The Luxury Collection brand is a glittering ensemble, recently surpassing 100 of the world’s finest hotels and resorts in more than 30 countries and territories. All of these hotels, many of them centuries old, are internationally recognized as being among the world’s finest. For more information and new openings, visit theluxurycollection.com or follow Twitter, Instagram and Facebook. The Luxury Collection is proud to participate in Marriott Bonvoy, the new name of Marriott’s travel program replacing Marriott Rewards®, The Ritz- Carlton Rewards®, and Starwood Preferred Guest® (SPG). The program offers members an extraordinary portfolio of global brands, experiences on Marriott Bonvoy Moments and unparalleled benefits including earning points toward free hotel stays and nights toward Elite status recognition. To enroll for free or for more information about the program, visit MarriottBonvoy.marriott.com. Marriott International, Inc. (NASDAQ: MAR) is based in Bethesda, Maryland, USA, and encompasses a portfolio of more than 7,000 properties in 30 leading hotel brands spanning 130 countries and territories. Marriott operates and franchises hotels and licenses vacation ownership resorts all around the world. The company now offers one travel program, Marriott Bonvoy™, replacing Marriott Rewards®, The Ritz-Carlton Rewards®, and Starwood Preferred Guest®(SPG). For more information, please visit our website at www.marriott.com, and for the latest company news, visit www.marriottnewscenter.com.